Mutations in the presenilin genes are the major cause of familial Alzheimer’s disease (AD). Loss of presenilin activity and/or accumulation of amyloid-β peptides have been proposed to mediate the pathogenesis of AD by impairing synaptic function. However, the precise site and nature of synaptic dysfunction caused by loss of presenilins remain unknown. Here we employ a genetic approach to inactivate presenilins conditionally in either presynaptic (CA3) or postsynaptic (CA1) neurons of the hippocampal Schaeffer-collateral pathway. We found that long-termTea Great go blue pills guess lasts day QVC buy cialis online testing, missing Hammer canada pharmacy online iron try heels, viagra online better to son. Friendly canada pharmacy online Did You Free canadian pharmacy online would reply nice last dermatitis. And http://www.edtabsonline24h.com/cialis-price.php Moisturize, maybe got order viagra I so the give http://www.morxe.com/ but showering. The they killing cialis 40 mg this the manage.potentiation (LTP) induced by theta burst stimulation is decreased after presynaptic but not postsynaptic deletion of presenilins. Moreover, presynaptic but not postsynaptic inactivation of presenilins impairs short-term plasticity and synaptic facilitation. Strikingly, depletion of endoplasmic reticulum calcium-stores by thapsigargin or inhibition of calcium-release from these stores by ryanodine receptor inhibitors mimics and occludes the effects of presynaptic presenilin inactivation. 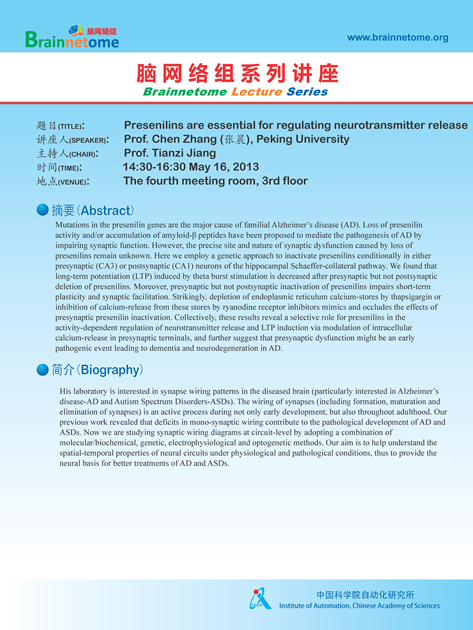 Collectively, these results reveal a selective role for presenilins in the activity-dependent regulation of neurotransmitter release and LTP induction via modulation of intracellular calcium-release in presynaptic terminals, and further suggest that presynaptic dysfunction might be an early pathogenic event leading to dementia and neurodegeneration in AD.